Rick and Gail Australia 2010: Kadina and The Yorke Peninsula - Our Australian Home for One Year! We hope you enjoy our first attempts at blogging! This is to prevent you from receiving long boring messages that arrive on your screen when you're not ready to sit back, relax and read about our life. This way, you can come into our blog on your time, when you want and check up on us. We hope you like our stories! See you soon. 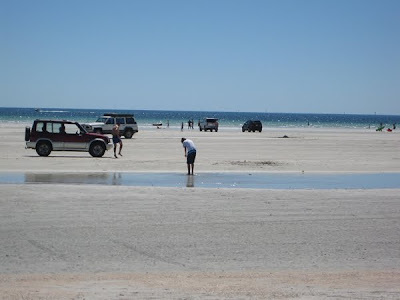 Kadina and The Yorke Peninsula - Our Australian Home for One Year! As you no doubt are aware by now, our teacher exchange home for 2010 is Kadina, South Australia. 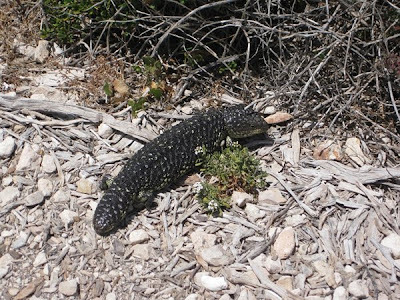 Kadina is derived from an Aboriginal word meaning “Lizard Plain”; however we have yet to see a lizard in Kadina. We are either not looking in the right spots or else the lizards have disappeared as the area has become more populated and habitats have changed as a result. 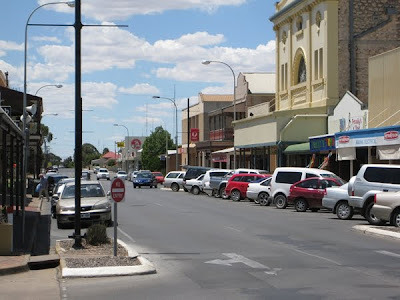 Kadina is a town of approximately 4,000 people situated at the north end of the Yorke Peninsula approximately 1½ hour drive northwest from Adelaide. It is the largest town on the Peninsula and serves as the retail and local government hub for the west side of the Peninsula. 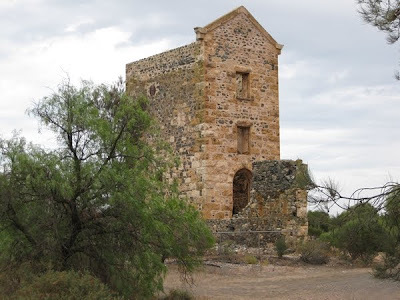 Observations about the Town of Kadina and the Yorke Peninsula are highlighted below through a number of photographs and miscellaneous comments. Kadina as well as most communities on the peninsula have numerous examples of buildings constructed at the turn of the century. The architecture of these buildings is typical of the era and times. For example, the buildings are made of stone or brick and are only a maximum of three to four floors in height. The buildings have amazing ornamental highlights, facades and verandas. Kadina’s Town Hall Clock Tower and its central park area remind us very much of the “Back to the Future” movie. The only exception being that Kadina’s clock keeps excellent time. 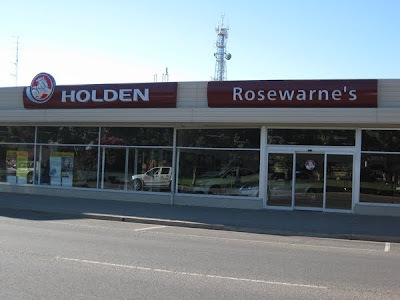 Kadina can boast of having the oldest continuous operating General Motors outlet in Australia. In fact, the proprietor thinks it may be the oldest GM dealership in the world. 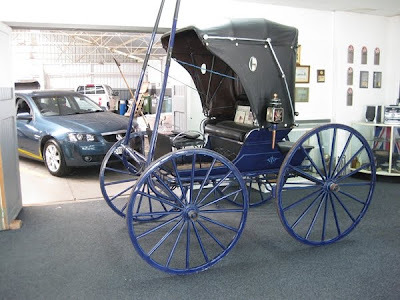 Rosewarnes started business in 1882 selling and manufacturing horse-drawn wagons and has not relocated its business from the original site. By 1902 the company was selling Oldsmobiles and has never looked back. It is our understanding that both the fifth and sixth generation of the family are presently working at the dealership. 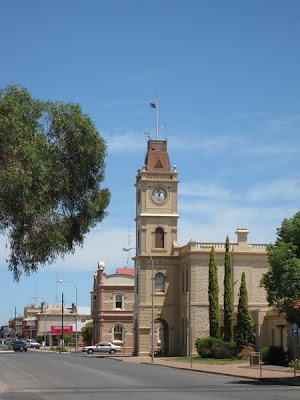 Kadina is one of three towns that make up the “Copper Triangle”, with the other two towns being Wallaroo and Moonta. At the turn of the century, these three communities were bustling with approximately 20,000 people supporting copper mining and smelting. Today remnants of the mining activities can be seen on the landscape. Walleroo which is located 8 km from Kadina is home to the “North Beach”, one of the most beautiful beaches on the peninsula and perhaps all of South Australia. 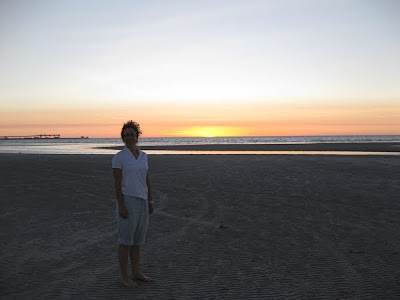 Walks along the beach at sunset; as well as wading in cooling waters when temperatures are in the 30’s or 40’s has a way of calming one’s inner soul and re-igniting feelings of passion with those you love. Fishermen cast their lines off the jetty in hopes of catching garfish or other local treats. Anticipation is seen on the faces of both young and old as they raise their nets in hopes of catching Blue Crabs. We frequently pinch ourselves to remind us of how fortunate we are to have the opportunity to witness and experience such a wonderful setting. We sometimes wonder if people living in Kadina know how lucky they are to be living in such an incredible place? They live in a beautiful peaceful town where they can walk the streets at night without fear and gaze upon a starlit sky. They are only minutes away, without the bother of any traffic irritations, to all the day to day living amenities that are needed to sustain their being. Should they wish to immerse themselves in a foreign environment, they are only a two hour drive away from an international airport that will jet them away to anywhere they may want to go. The world famous Clare and Barossa wine valleys are only a Sunday’s drive away. In addition, Adelaide is a cosmopolitan city with a lively sport and arts community and a bevy of activities that could keep one busy for a life time. 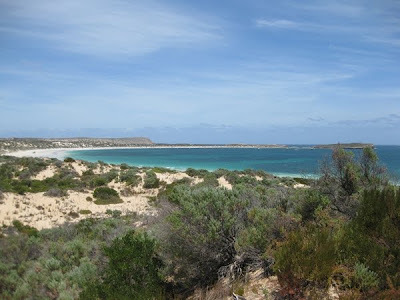 The Yorke Peninsula offers more than 600 km of coastal shoreline. 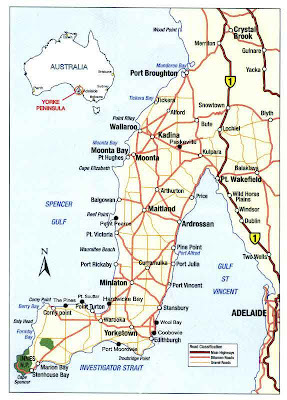 Like Italy, the Peninsula is frequently described as being “boot shaped”, with its toe punting into Spencer Gulf and its heel in Gulf St. Vincent. It has been stated that it is the “Leg” upon which South Australia stands. The peninsula is approximately 260 km (160 miles) long and 40 km (25 miles) wide. One of the things we find amazing is that we have not seen any evidence of a river or creek on the peninsula. This phenomenon only goes to illustrate the importance of water in the region and how the residents have adapted accordingly (see earlier Blog – Water and the Desert). The Peninsula is noted for its agricultural industry. It has been interesting to discover that the peninsula has no rail line. As a result, cereal crops such as wheat and barley are shipped out from a number of ports. Historically, ketches, schooners and later steamships were used to collect the crops in bags from jetties or piers that were constructed at nearly every ocean-side port on the boot. Many of these ports have since become obsolete as roads improved, freight-handling systems shifted from bags to bulk, and grain carrying ships became larger. 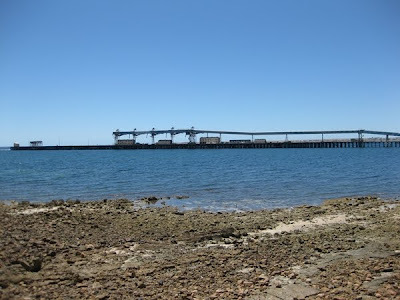 Today, grain is only shipped from three ports: (i) Wallaroo located on the north-west side of the peninsula, (ii) Ardrossan at the top of the Gulf of St. Vincent and (iii) Port Giles near the south-eastern tip of the boot. There are many similarities between western Canadian farming practices and those on the Yorke Peninsula. For example, we have been told that on the Peninsula, no-till drilling is strongly encouraged to retain soil moisture. Similarly a crop rotation of wheat, barley, lentils or wheat, wheat, lentils is practiced. The lentils are nitrogen fixers, thus adding needed fertilizer into the soil. Barley is used to abate wheat pathogens. One thing that we have noted that is different in agricultural practices is the absence of grain storage bins on the Peninsula. In our travels throughout the peninsula, there are very few farms with storage bins. This may be due to the different grain handling facilities located at the ports. 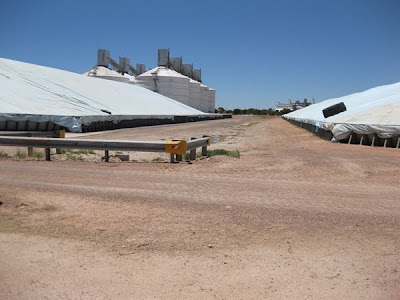 Because of the dry climate, most of the grain is stored outside in contained areas and covered with tarps. Moisture or mould to reduce the quality of the grain is not an issue here due to the absence of rain and the high ambient temperatures in the summer. Hence, the reason for outside storage. By fall/winter the stored grain has been shipped from the terminals. This may also explain the absence of storage bins on the landscape. Once the crop has been harvested, sheep are typically released into the fields. You never hear a farmer call his field a “field”. It is referred to as a “Paddock”. However, they do refer to agricultural fairs as “Field Days” and not “Paddock Days”. The sheep are released to graze on the stubble as well as residual seed not picked up by combines in the paddock. We have been told that during years of good yields, there is an abundance of grain (either at the terminals or in the paddocks) which results in an infestation of mice which leads to an increase in the snake population. It appears as if snake population fluctuations are no different to the classical Canadian study that observed that the increase or decrease in Lynx populations was directly proportional to rabbit populations. 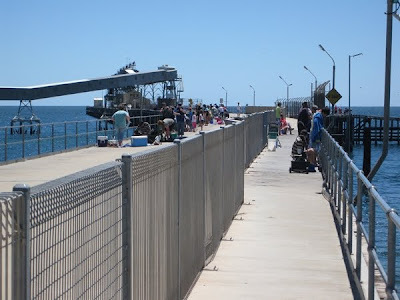 The demise of grain handling at many of the small ports along the Yorke Peninsula has inadvertently resulted in the creation of an excellent recreational sports fishery for the area. The abandoned jetties are now a main feature in many of the coastal towns and have become popular holiday spots which are ideal for shore-based anglers and crabbers. The Yorke Peninsula has become one of the top fishing destinations for South Australia. Innes National Park, covers 9,100 hectares along the south-western tip of the Peninsula. It is known as one of the Yorke Peninsula’s gems. It has secluded sandy beaches, a rugged and rocky coastline and spectacular vistas. Some think the vistas equal those of Australia’s Great Ocean Road. Along we have not visited the Great Ocean Road yet, we have concluded that its scenery must be equivalent to the Banff – Jasper Highway; with the difference being one showcases ocean vistas whereas the other mountains. The Park is a mecca for scuba divers, surfers, fishermen and hikers. We were fortunate enough to see emu’s and shingle-back lizards. The shingle-back is distinctive member of the lizard family known as “skinks.” When confronted by a predator, they confuse their attacker by bending their body into a semi-circle because the head looks very similar to the tail. Their thick tough skin provides protection against predators and keeps moisture loss to a minimum. 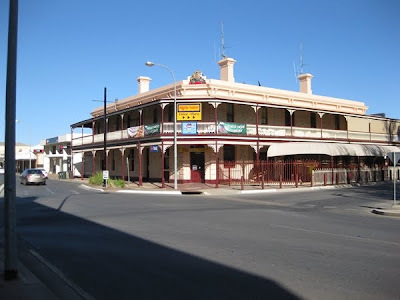 Check out this interactive map web site of South Australia and view Kadina - the town where we will be staying in 2010. 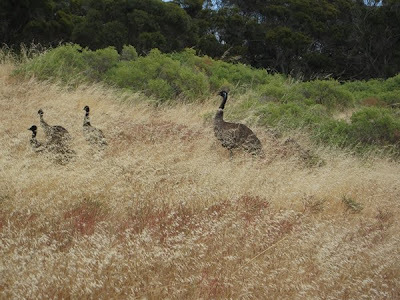 We're close to vineyards (Barossa Valley) and national parks (Kangaroo Island). Australian Shiraz, here we come! DRIVING ON "THE OTHER SIDE"